Prince Harry and Meghan are set to welcome their first child together. Source: Getty. They’re due to welcome their baby in just a matter of weeks and while Prince Harry and his wife Meghan have kept official details to a minimum, they’ve been dropping subtle hints about the arrival of their first child for months now. From the exact due date and gender, to top name choices and more, rumours are continuing to pop up right around the world as bookies are flooded with bets on the newest member of the British royal family. The couple first confirmed they were expecting on their tour of Australia in October last year. Since then, the Duchess of Sussex has continued a hectic schedule of royal engagements with her husband of almost one year – showing off her steadily growing baby bump in a stream of stunning maternity outfits. Harry and Meghan have not released the exact date they’re expecting to welcome their baby, with the palace simply saying “spring 2019” in their official announcement at the time – but they have dropped a fair few hints in recent months. On a royal visit to the UK town of Birkenhead in January, Meghan was overheard chatting to a woman in the crowd by ITV’s royal correspondent Chris Ship. 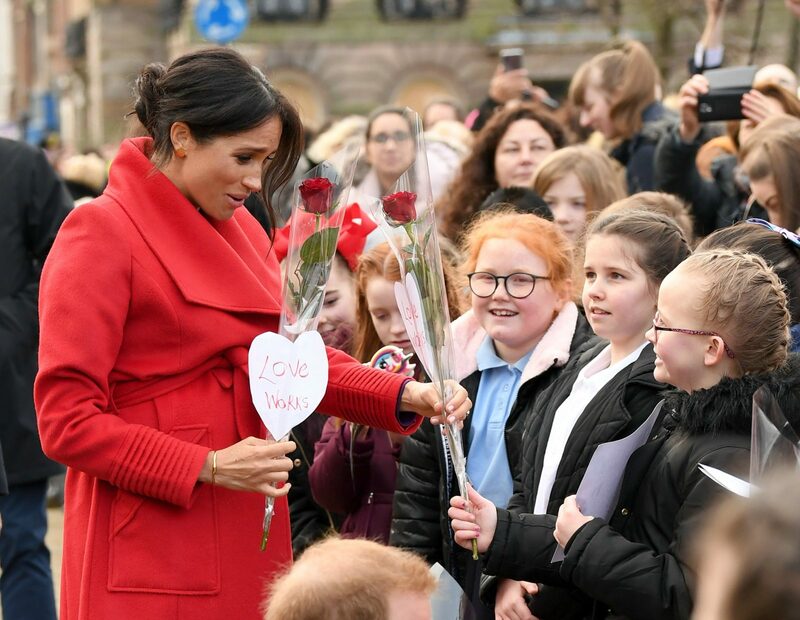 Meghan met with fans in Birkenhead in January to share some clues. Source: Getty. While Meghan and Harry have confirmed they won’t be revealing their baby’s gender to the public, there are plenty of theories on whether they’ll be welcoming a male or female cousin for George, Charlotte and Louis. However, according to Us Weekly, a source at Meghan’s recent baby shower has claimed the duchess told friends she is having a baby boy – although that has not been confirmed by the royal family. Further rumours went into overdrive when Meghan’s close friend Abigail Spencer was spotted carrying a gift wrapped in blue paper. However, bookies say otherwise – with Ladbrokes revealing current odds are on it being a girl. Either way it’s been claimed that the couple don’t yet know themselves, after Meghan was reportedly heard telling a fan on her visit to Birkenhead that they wanted it to be a surprise. Top Aussie psychic medium Julie McKenzie previously shared her own predictions on the royal baby with Starts at 60, and actually claimed at the time that there’s a chance Meghan was pregnant earlier than she originally let on. However, that theory appears to have been disproven now as the duchess is yet to give birth. What are the favourite name choices? With the gender of the baby remaining a secret, there are a whole host of names rumoured to be on the shortlist for the new royal baby – both modern and traditional. But according to Ladbrokes, Diana remains a firm favourite in honour of Prince Harry’s beloved late mother. His brother Prince William and wife Catherine gave the name to their daughter Charlotte as a second middle name, but it’s unclear if Harry will do the same – or even choose it as a first name. Meanwhile, Ladbrokes has Victoria and Alice as other favourites for girls’ names, while Albert and Philip are favourites if it’s a boy. Also making the top list are Elizabeth – a tribute to the Queen – and James. William Hill had Victoria (8/1), Diana (10/1), Isobella/Isabella (12/1) and Alice (12/1) as the favourites at the time for girls’ names, and Arthur (14/1), Edward (16/1), James (16/1) and Philip (16/1) making the cut for a boy. Will it be a morning or evening birth? According to Ladbrokes, odds are currently on the baby being born in the morning (any time between midnight and midday the next day), while the least favourite choice is currently the afternoon. Where will Meghan give birth? Prince William and Catherine welcomed all three of their children at the Lindo Wing. Source: Getty. Meghan has proven she’s not afraid to break away from long-standing traditions during her short time in the royal spotlight so far, but she’s yet to confirm if she’ll follow in the Duchess of Cambridge’s footsteps (as well as Diana’s) and give birth at the Lindo Wing at St Mary’s Hospital in Paddington, London. However, according to Russell Myers, royal editor at The Mirror, there’s also a possibility she “could opt for the comfort of being at home”. Are you excited for the royal baby’s birth? What are your predictions?